A short-cut to a classic French sauce? Mais oui! “Sauce Guys” Brad Sacks and Bill Finnegan, and the More Than Gourmet staff have done the shopping, chopping, mixing and slow-simmering to make this delicious “foundation sauce” that will have you on your way to compliments before you can say “sous chef”. One of Central Market’s “foodies” did an excellent job of selling us on the foundation sauces. First, they are made with real food – nothing artificial. The recipes are formulated so home or professional cooks can add a variety of seasonings to make the sauces their own. More Than Gourmet’s website has a great selection of recipes to encourage creativity. The sauces are shelf-stable, so they are easy to keep on hand. Finally, the soft-packs are easy to store and environmentally friendly. Karen picked up the red wine sauce and I chose the white to try. I can’t believe the foundation sauce sat in my pantry as long as it did. My thought was to try one of the more complex and elegant recipes on MTG’s website for a special dinner. As it turned out, the sauce was the starting point for a great alternative to take-out at the end of a workday that lasted just a little too long. 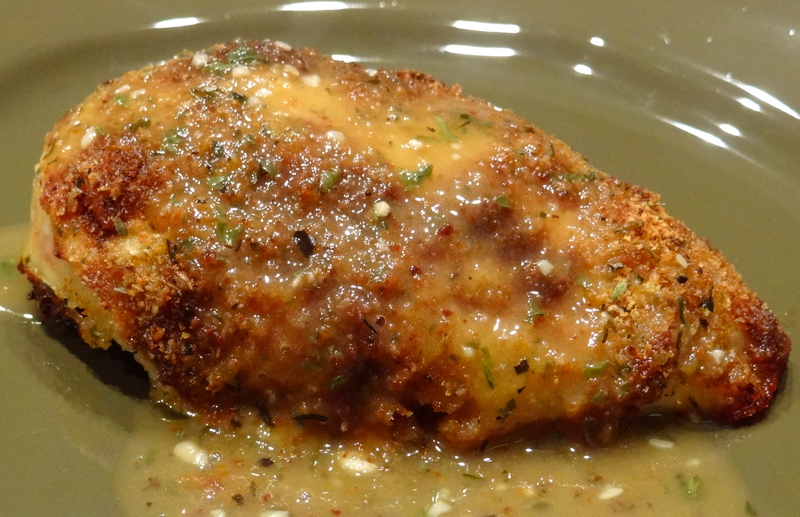 More Than Gourmet’s Garlic Sauce recipe seemed like a natural with baked parmesan chicken. You may already have a parmesan chicken recipe in your repertoire that you can dress up with this delicious garlic sauce, but here is how I prepared mine. Preheat oven to 375°. Line a shallow baking sheet with foil coated in nonstick spray. Mix 1/4 cup shredded parmesan cheese with 1/2 cup Greek yogurt or mayonnaise. Place 4 boneless, skinless chicken breasts on baking sheet and cover with parmesan cheese mixture. Sprinkle about a tablespoon of Italian bread crumbs over the cheese mixture. Bake for 40 minutes, or until chicken is done. Warm the olive oil in a saucepan over medium-low heat. Add minced garlic and sauté until golden, about 2-3 minutes. Add the More Than Gourmet White Wine Sauce, parley and thyme and simmer for 4-5 minutes. Season to taste with salt and pepper. Plate the chicken breasts when done and ladle the garlic sauce over them. Enjoy! The sauce had promise from the start. When I opened the carton, it was very fragrant, and as I poured it into the saucepan, it was smooth and silky. In less than ten minutes, the garlic sauce was ready to top our parmesan chicken. More Than Gourmet offers a pantry full of sauces and stocks you can order directly from their site. There are vegan and gluten-free options for those with dietary restrictions or preferences. The Sauce Guys have poured their love of classic French cooking into their products, and they have organized their website so you can easily search recipes by product, cooking method, occasion, or degree of difficulty. We’re counting this as a great find!